Even though we just arrived in Japan last night, we set out this morning for our highly anticipated overnight trip to Kyoto. We traveled by highway bus from Nagoya Station to Kyoto Station. Japan has fostered a culture of convenience; people expect convenience stores to be nearby, always open, and stock appealing fresh food. Our students eagerly examined a large number of new and unfamiliar items in the 10 minutes that they had to shop. Some snacks purchased included a “Mystery of Love” flavor sour gummy candy, and a “Sweet Peanut Cream” sandwich (with crusts removed, of course). 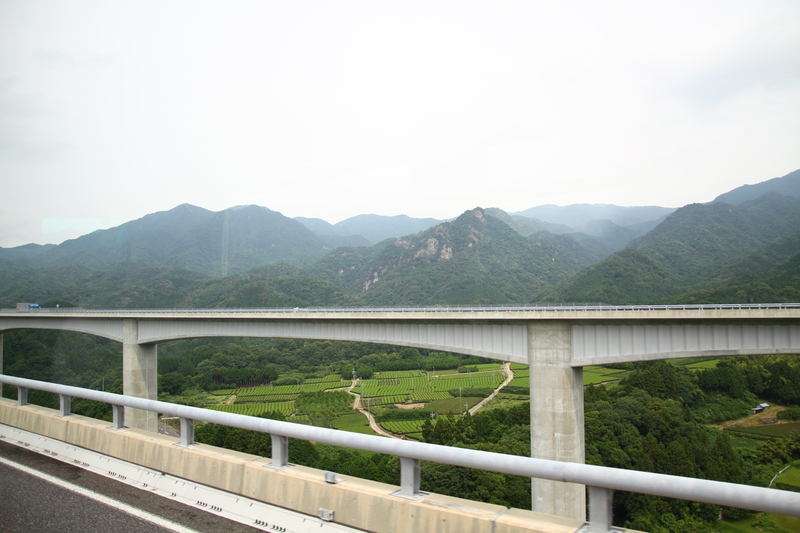 The large windows on the bus gave us a beautiful view of bamboo forests and lush mountains on the way to Kyoto. Our students were heard commenting throughout the ride on the shape of the trees, the design of the highway and bridges, and the “Watch Out For Crossing Monkeys” sign. After arriving at Kyoto Station, we checked into our hotel, dropped off our bags, and set off on our Kyoto tour. Our first stop was Nijoujou Castle. 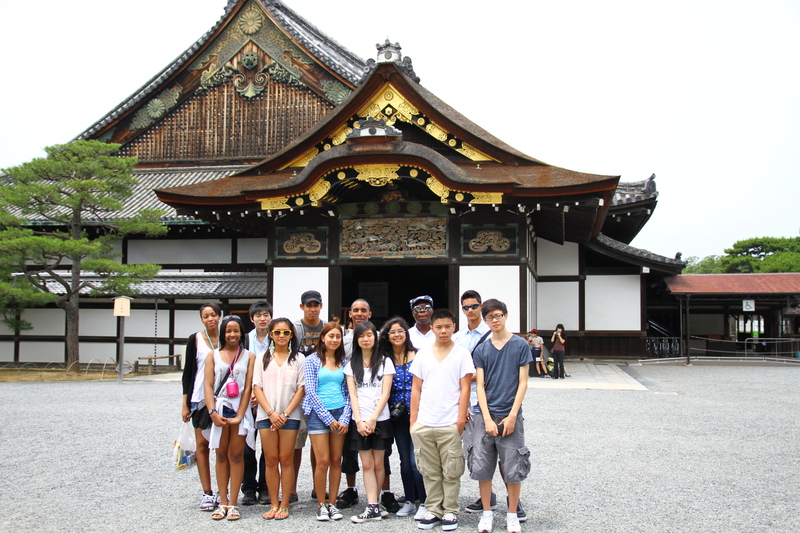 Our students learned about daimyo feudal lords visiting the shogun at this palace in Kyoto during feudal times. After visiting Nijoujou, we traveled to Kyoto University to have lunch at the student cafeteria. The university has a bustling campus, and the cafeteria offered an impressive variety of dishes at reasonable prices. Our students were slightly overwhelmed by all the choices, but everyone was able to decide on 1-2 dishes that appealed to them. Some of the dishes our students ordered were “katsukaree” (deep-fried pork chop in Japanese curry), soba and udon noodles, Chinese stir-fry with a “kick” (with meat, cabbage, and eggplant), and ramen with fried jumbo dumplings (gyoza) on top. After lunch, we traveled to Ginkakuji Temple, the Silver Pavilion. The narrow road, just wide enough for a car to drive slowly through and avoid hitting pedestrians, is lined with shops selling local souvenirs and delicacies. 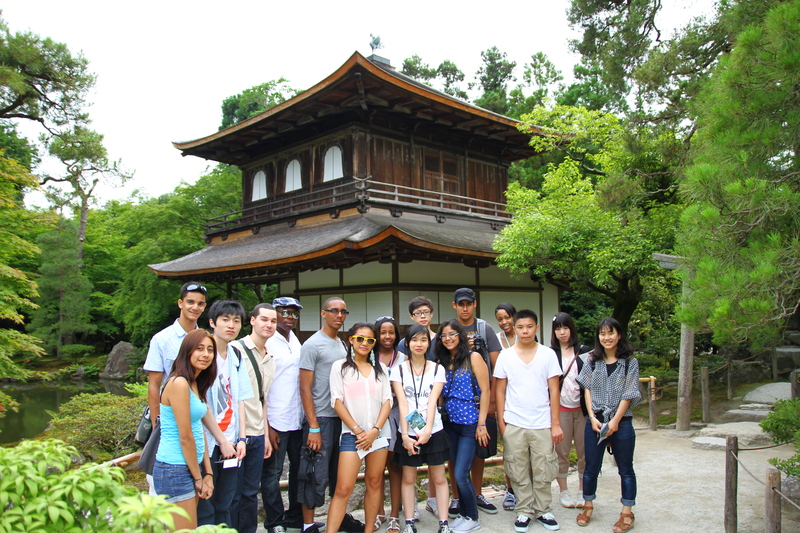 Our students were impressed by their first Japanese temple. Students made observations about the design and landscaping of the temple grounds and admired the architecture and style of the temple itself. We continued on to Kiyomizu-dera Temple, perched high in the hills of Kyoto. Our students were blown away by the unexpected panoramic views of the city and the temple approach below. Despite having a view of the entire city of Kyoto, Kiyomizudera has the atmosphere of a mountain retreat, with steep layers of trees and greenery surrounding the temple and its approach. The temple itself rests on a grid of thick wooden pilings built into the steep mountainside. 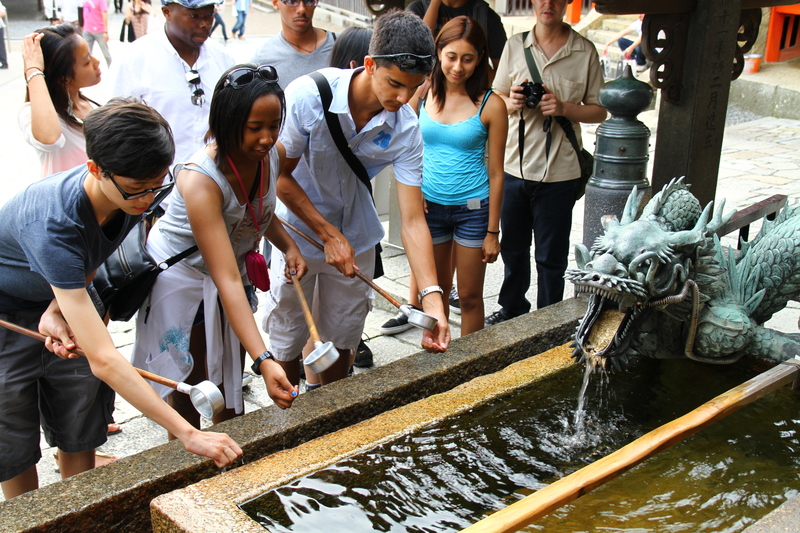 The name “kiyomizu” means “purifying water.” Many of our students enjoyed catching the natural spring water from the mountain into special cups and drinking it for health, beauty, and wellness. Our students also received their fortunes at the temple. Unfortunately, some of our students received “unlucky” fortunes and were encouraged by their fortunes to endure and wait for better times. 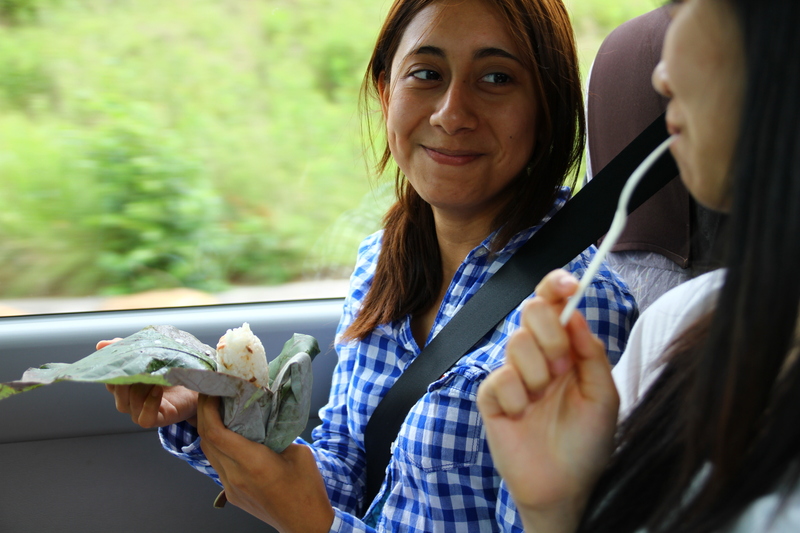 Returning down the temple approach road, our students did some brief souvenir shopping. 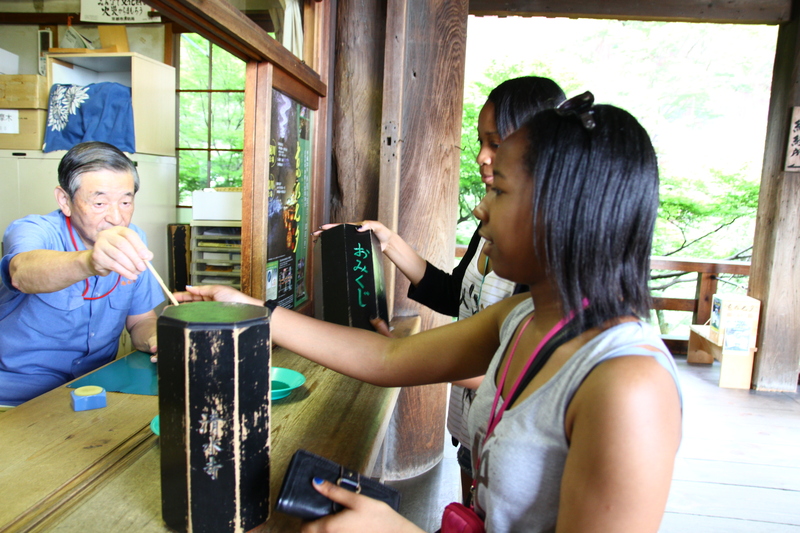 The most popular stop was a Kyoto chopstick shop; some of our students purchased chopsticks and had their names engraved. We made our final stop at Yasaka Jinja, a famous shrine in Kyoto. 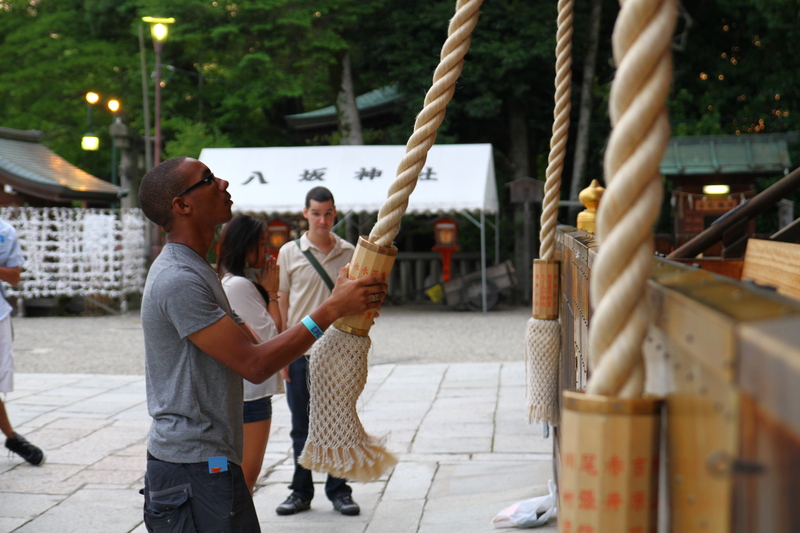 Many of our students took part in local customs, such as sending greetings at the shrine, and walking through a large circle shaped from rice stalks three times for a good harvest. 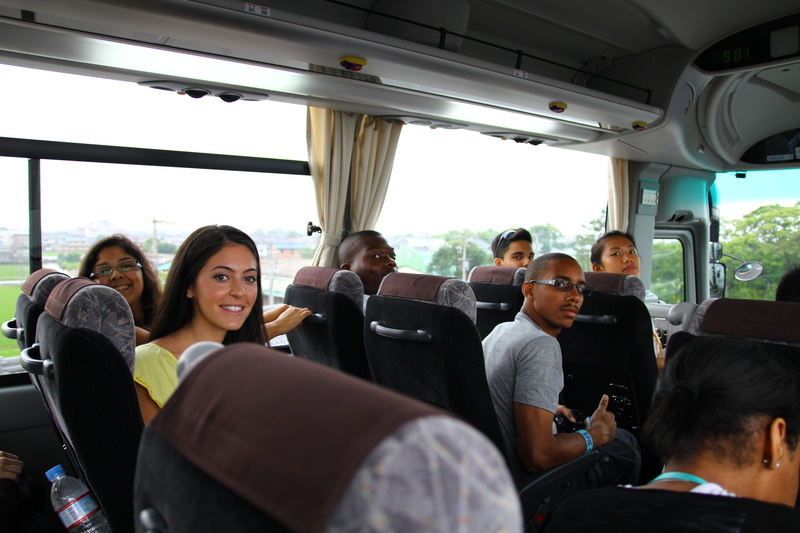 After arriving in Kyoto, all of our transportation was by local bus and on foot. Altogether, we took 6 (!) local buses in Kyoto today. Our students were advised about manners in Japan before the trip by our chaperones, and they proved today that they had been listening. Our students offered their seats to elderly passengers, were mindful of the volume of their conversations, and positioned themselves so as not to interrupt the flow of other passengers during the ride. Needless to say, with so much activity after only 24 hours in Japan, our students were completely exhausted by the end of the day. We returned to the hotel for a light dinner and some much-needed down time. The students got a second wind and enjoyed trying on their “yukata,” a cotton version of a kimono given by hotels as nightwear, and wearing their slippers around the hotel. Not surprisingly, the slippers were too small for nearly all our students and their feet hung out over the back, but our students flopped around happily. Three of our students are sharing a washitsuroom (Japanese-style room) with with tatami straw mats, real futon for sleeping, and traditional Japanese decor. 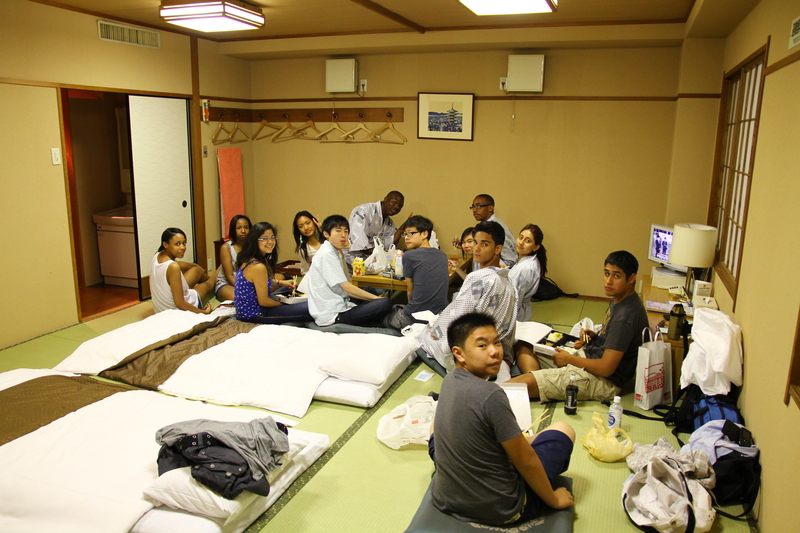 This room is quite large for a Japanese room, and the other students decided to congregate there and make it the “hang-out room” until room check. All students are now sleeping soundly. Here are some pictures from our first full day in Japan. Tomorrow will be another full day of sightseeing in Kyoto and we will return to Nagoya in time for students to have dinner with their host families. View more photos from their trip! This album will continually update during their 9 day stay in Japan. A group of 7th graders in Ms. Warren and Ms. Pechersky’s class worked very hard this year to improve their skills and to have higher grades in mathematics. Every day, they tracked their progress; made sure they stayed on every task in class, completed their homework, and studied their class notes. As a result, they had a significant leap in their report card grades. 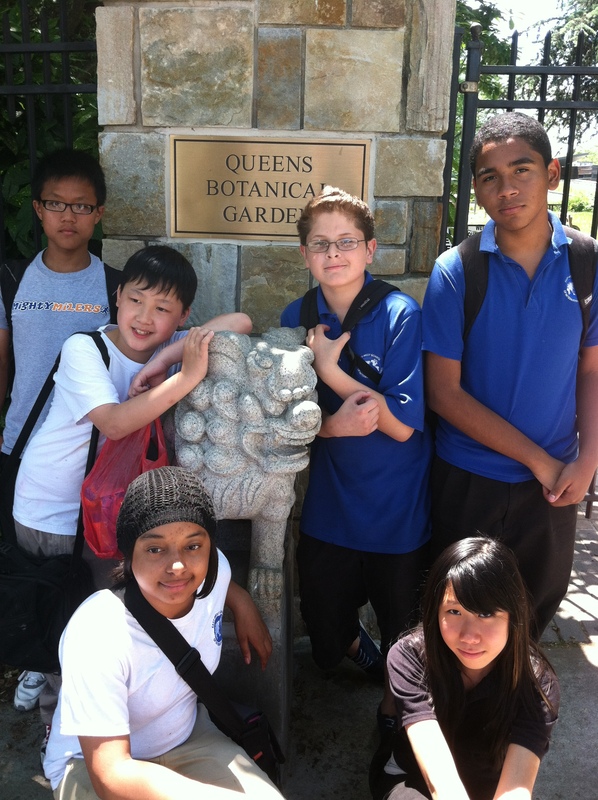 In celebration of their success, Ms. Pechersky took the group to Queens Botanical Garden for a half-day excursion. Students enjoyed using their math skills to identify symmetry in nature, calculate percentage of the discount they got, and determined the time they needed to get back to school. They learned new plant names and observed birds, butterflies, and insects in their natural habitat. Ms. Ahmed helped supervise the group and took pictures. Everybody enjoyed the outdoors, the weather, and each other’s company.